In 1987, the National Center for Constitutional Studies commissioned me to do a painting to commemorate the bicentennial of the signing of the U.S. Constitution. They wanted a large painting to unveil at a ceremony at the University of Utah. I read everything I could find about the actual signing and those people who were involved. Members of the group who asked me to do the painting had a stack of books and other resources for me, and they suggested some of the most prominent of the signers who might be included in the painting, They also told me the story of Benjamin Franklin crying when he signed the document, which I based this painting on. 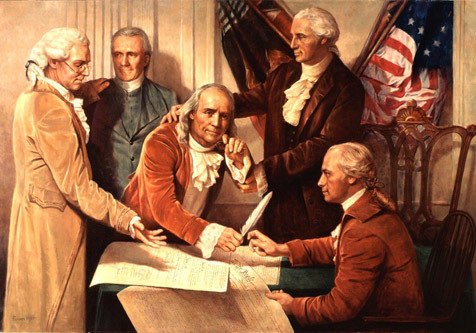 I did a lot of research about the signing and about the five men who are depicted in the painting. I needed to know how old they would have been on that day, how tall they were, what kind of build they had, and approximately how much they weighed. I also studied what they would have worn. It was really fascinating learning about these men. I found models for the painting who closely matched physical descriptions of the five men in the painting: James Wilson, Roger Sherman, Benjamin Franklin, George Washington and James Madison. I was looking for accuracy in their size and ages to set up the right pose for the painting. I used existing paintings as reference for the men’s faces. An interesting thing happened as we were preparing to take the painting to Salt Lake City for its unveiling. It is a huge painting — about five by eight feet — and the only way we could transport it was in our station wagon. We loaded the painting in the back and our three small children in the car, ready to go, when I remembered I had to get a copy of my resume to deliver to President Ezra Taft Benson. Lynette and I hurried into the house to find the resume and when we came back outside to get in the car, it wasn’t there. We lived on a hill, and in a panic, I looked down to see that the car had rolled backward down the hill. It’s rear half was in the irrigation canal and the kids were climbing out the front. My four-and-a-half-year-old- daughter had taken the gearshift into neutral. I ran down the hill as fast as I could, past the kids (since I could see they weren’t in danger) and jumped into the canal to save the painting. We ended up having to leave the car in Idaho and borrow a neighbors' van to make the trip.